Just a quick note to let everyone know that the house still stands, and I am alive. Who knew? 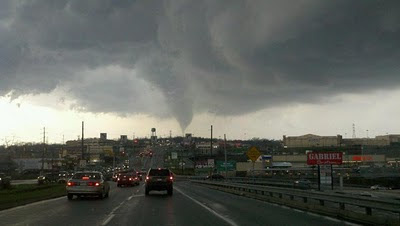 The tornadoes caused some damage and some funny videos have surfaced, but I think everyone is ok. Since I was a kid I had dreams of tornadoes sucking me up and spitting me out into the sky. Not today, I guess. The sky turned an eerie shade of green and Tasha grabbed Mr. Winston and put him in the basement, while I finished cooking my ham. Ha! Edit: peep this photo, kids!